This is the one thing that's kept me from buying the Omni so far. First of all, props to Virtuix for helping advance VR. The Omni appears to be a fine product. But.. that blasted ring. To me, this breaks immersion with anything that's not a FPS that you may be walking around in and want to hang your arms by your sides. I don't want to be playing a survival horror game or an RPG, for example, and have to hold my arms up in the air, artificially, to keep from bumping my forearms/elbows into the ring. I realize that some may be holding an Xbox controller while playing, but what about Vive and Oculus Touch owners where motion controllers come into play? It will get tedious having to hold your arms above the ring unless it's necessary in the context of the game (like if you're holding a gun or a weapon at the ready or using the motion controllers to reach up and grab something/pull at something). Is there any R&D into alternate ways to keep the player stable on a slippery surface aside from being encapsulated in a ring-like object? This is one reason I'm looking at the KatVR solution. Your elbows shouldn't bump into the ring if you have it set at the correct height. While I do understand your point of view, I have used the Omni to play non-FPS games like Minecraft and Skyrim and have not missed the ability to hang my hands down by my sides or felt that it was tiring. Probably because your arms are still moving, and you're holding a controller (which is a more relaxed way of keeping your hands in front of you). On the contrary, the ring being there has proven very useful. In almost every game I've played there has been a time where I've had to wait (though a cut-scene typically) and I immediately lean against the ring. It actually makes gaming less tiring because you have something to lean on / against. You can sink into the harness a bit and rest your elbows on the harness frame while you're playing which is another way of extending your session, or you could wear a jacket and put your hands in your pockets if it's a walking simulator (or you just want to walk around Skyrim/Los Santos. You might find that gaming on the KatVR would be more tiring, more quickly. I have tried it myself, and came to the conclusion that having the support at waist height increases player stability. ^ The ring is useful! Interesting perspective, sutekiB.. thanks for your reply. I can see how it could be helpful in resting situations. I guess my concern comes from several room scale games I've been playing on the Vive where I'm resting my hands, and the controllers, down by my sides. And I'm just wondering how well that would work if there's a ring around my body. The jacket pockets is an interesting idea but may get hot. How about the harness? Is it very bothersome? I've been doing a lot of brainstorming on ideas for how to improve the Omni platform. Either a 2.0 or a "deluxe/pro" version. 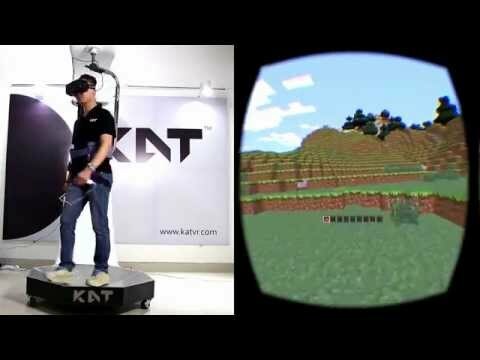 The KatVR's pivoting arm support is actually probably a much better design in terms of allowing the player to move freely and naturally, but has the flaw of not really providing a proper HMD passthrough to prevent turning from causing the cables to wrap around the arm. There are some ways to address this issue, but none that I can see in the actual design for the KATVR. Either they are expecting the player to self regulate their turns to prevent the cable from snaring, or they are expecting it to be used with wireless HMDs like the Gear VR. It's possible they have some sort of pivoting passthrough hidden up in that big overhead compartment. The bigger concern right now is that it has been several months (December of last year) now that KatVR hasn't given any progress dates whatsoever. There's really no way of telling if they are going to be successful or not, particularly now that Virtuix is going to be stealing some of their thunder with actual production models shipping out to buyers. At this point, I feel like the best chance for VR is that Virtuix will be profitable enough to be able to continue development and come out with that deluxepro version which will incorporate that arm support. Even if they do, there will likely still be call for the current Omni, since it still has the advantage of fewer moving parts, and thus better lifetime expectancy.